This side-splitting play needs no introduction to Garrick regulars as it?s a smash hit every time we perform it. Unashamedly politically incorrect, this hilarious comedy transports us to riotous antics at the wedding of Deirdre and Mark. The fun begins on the stag night when an inebriated Mark is chained to a lamppost with a blow-up rubber doll. The wedding itself is hysterical too, with half the guests, including the priest, suffering blinding hangovers. If you delight in comic chaos and a night of high-spirited farce ? this is the play for you. IF you pine for the days when political correctness hadn?t been thought of and an expensive pint would set you back 75p, you?ll particularly enjoy Fur Cot And No Knickers. The humour in Mike Harding?s invariably dated but hilarious in parts comedy is of the seaside postcard variety and only the incurably prudish would take offence while watching Altrincham Garrick?s latest production. As for the best scene, that definitely comes when posh boy Mark Greenhalgh (Anthony Morris) ends up spending the end of his stag do in the arms of, shall we say, a very different kind of woman. Enter two policemen and the booze sodden explainations begin. Most people who go to see Fur Coat will be there for a ?reet? good laugh and to watch drunken people make fools of themselves. But Harding makes a couple of serious points about the treatment of the working class and the way most of this country?s wealth is in the hands of the few. Director Alan Rothwell has ensured the timing is spot on in this very watchable production and has brought out memorable performances from the likes of Barry Spencer as father of the bride Harry Olleranshawe, Janet Slade as Harry?s wife Edith and Adam Gonet as their son Peter, an angry young man who wants to change the world. Bill Platt is also very funny the perpetually sozzled Father Molloy. Enjoy your journey back to the 70s, to a north of England that no longer exists. Great fun. "Wedding ?chaos makes audience laugh"
Fur Coat and no Knickers, the Garrick?s latest production gets its name from snooty mother of the groom, posh (or is she?) Muriel Greenhalgh whose son, Mark (Anthony Morris), is marrying below his status. Mags Johnston, who plays her superbly in a Hyacinth Bouquet sort of way, doesn?t lift her coat so we don?t know whether or not she is wearing knickers but members of the cast do come out in their underwear during the obligatory wedding day fisticuffs. Edith Ollerenshawe?s daughter, Deirdre, is engaged to upper class Mark and Edith tries, unsuccessfully, to match the airs and graces of her daughter?s soon-to-be in-laws. Janet Slade?s Edith is so delightfully common you chuckle every time she speaks, especially when trying to emulate Mark?s family. What a contrast with Muriel! Stephanie Peake as Deidre gets the balance between her love for Mark and her upbringing just right. None of the bride?s side of the family are averse to a drink. Her granddad (a hilarious Brian Tickle) likes a tot of rum and making sexist remarks. And at the pre-wedding stag night the whole family get delightfully inebriated including Deidre?s two brothers, Kevin and Peter, (Ryan Clarke and Adam Gonet) and Hitler-obsessed father (Barry Spencer) as does Father Finbar Molloy the Catholic priest who is to conduct the wedding. Playing the priest, Bill Platt has more amusing lines than any other character and has the audience tickled throughout. Anthony Morris is particularly good in the scene where his character, Mark is chained to a lamp post with a rubber doll. His expression says it all! We enjoy the Stag Night, the unconventional wedding and the reception where humorous best man, Hamish (Ian Simmonds) comes into his comical own. I believe this play gets so many laughs because of its political incorrectness. Nothing is sacred not even the Roman Catholic church. 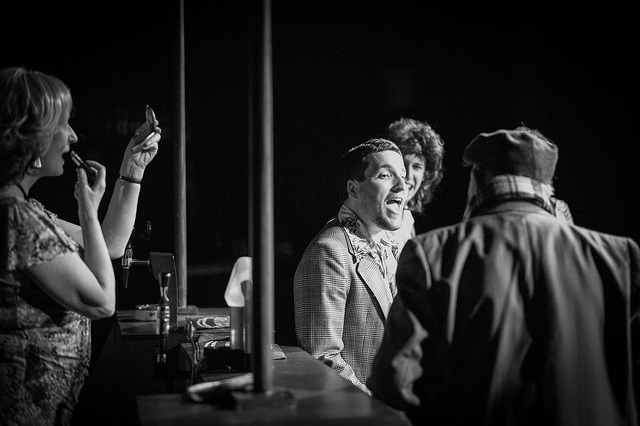 The cast of 19 take everything in their stride and provide a happy time for all who see them. I am especially grateful to the playwright, Mike Harding, for making most of them introduce themselves. There is no chance of getting confused about who is who. It?s almost sold out so hurry and buy your tickets whilst you can. Mike Harding's ?Fur Coat and No Knickers? is a satirical portrayal of British society that examines the interrelated themes of pride, stereotypes and social status. Although the witty script is funny on its own, bringing it to life for an audience of today is a challenging task as you stand the fear of presenting something which has already been seen several times over. If that is the Directors intended vision for the piece, then fine - though I always favour a fresh approach to revamp older text to avoid being labelled in the ?dated? category. A few minutes in, I questioned why the house interior had been positioned so far up stage as it created such a distance between ?us? and ?them? which hindered any engaging with the performances. 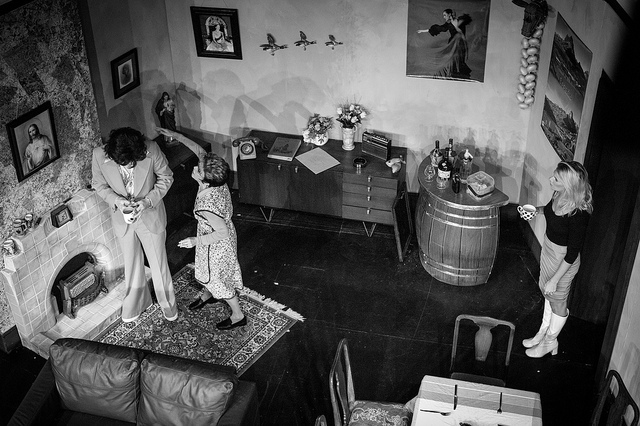 The reasons for this choice were made clear as the play unfolded, however, I feel a rethink of the set design, making it possible to bring the action further downstage would have benefited the delivery of the play. It can be tricky when lines are delivered from off stage, particularly in a venue of this size and with no microphones. As the set was so far upstage for the plays majority it was a struggle to hear dialogue at the best of times but was made impossible to hear when fed from off stage, thankfully this only happened a couple of times in the first scene. Stephanie Peake played bride-to-be ?Deidre? who I remember played a small part in ?Pack Of Lies? earlier this year, I was pleased to see her in a larger role. Stephanie has a natural quality on stage and now hope to see her in something more arduous as it?s evident she?s capable of tougher challenges. Stand out moments in the play were Brian Tickle as ?Nip? when he mistakes a joint for a cigarette - a priceless moment which was wonderfully delivered, I thoroughly enjoyed all of Brian?s scenes but undeniably the drag of the joint was his shining moment. 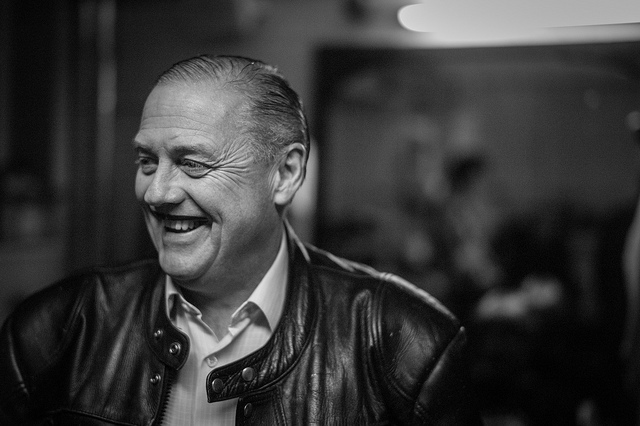 Martin Oldfield as ?Man In Catholic Club? who, for just a short scene and so few lines left such a strong impression which (I think it?s fair to say) stole the show. I particularly enjoyed the romp of chaos of the stag night at the end of act one which was lively, very comical and well received. Enthusing performances were on display from Janet Slade as ?Edith?, Ryan Clarke as ?Kevin? 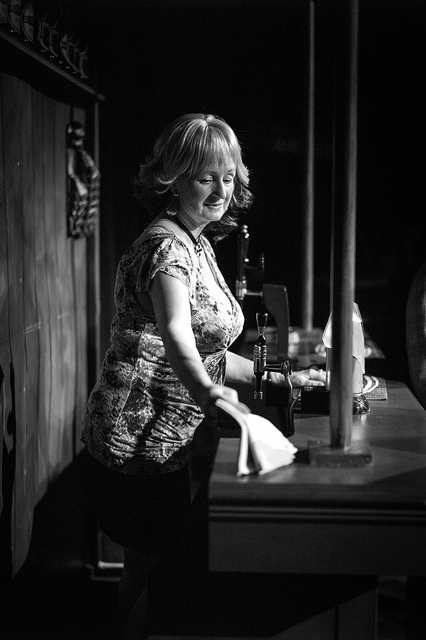 and Mags Johnston as ?Muriel? who are all, clearly, no strangers to treading the boards which heightens my overall feelings towards this production which is that?the script didn?t allow enough of the players to expose their strengths. It was evident, from seeing many of the players in previous productions that the fortes of the individuals on stage far outweighed what abilities are required for this play. Unquestionably, and it cannot be denied that the audience adored the play as laughter was flowing throughout the theatre. This has clearly been a triumph in the Box Office which is very encouraging, Congratulations on a successful and energetic production. ALTRINCHAM Garrick audiences are about to be invited to a wedding to remember - for all the wrong reasons. 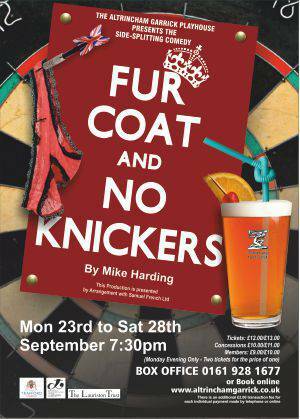 Fur Coat And No Knickers comes from the pen of comedy great Mike Harding and he said the gloriously politically incorrect farce was inspired by a real life event. He said: ?My sister's wedding - it was nothing like as manic as the one in the play but id did inspire me and once I started looking at other weddings and other families as well as my own - things really began to fall into place.? What makes a wedding such fertile comic territory? He said: ?Any key point in our lives is fertile ground for comedy. I once worked helping out my Uncle Harry who for a brief time ran a wedding catering business in Salford and I lost count of the number of times the police had to come to break up fights at the wedding receptions.? The play, which is a firm favourite with Traford audiences revolves around the impending nuptuals of Deirdre and Mark, who spends his stag night in the company of an ?adult? doll. Unfortunately for Mark, that isn?t the last he sees of his newly found friend. 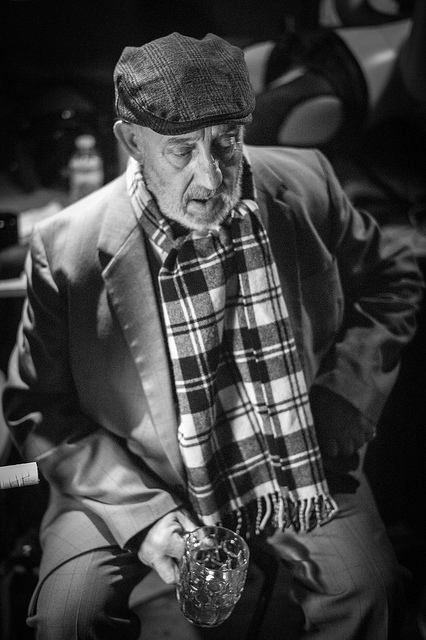 Mike said he?s aware of the high standards consistently achieved at the Garrick and wished the society well with the production. He said: ?Break several legs but make sure you don't pop the blow up doll. ?